Water is both the most abundant nutrient on Earth and in the human body. The world has about 333 million cubic miles of water, according to the U.S. Geological Survey, or USGS, and the human body is about 60 percent water. The United States withdraws about 410,000 million gallons, or Mgal, of water per day. That water has a number of uses, including power, irrigation for farming and industrial use, and public consumption. Water from the various drinking-water sources, as well as the water content of foods, has important health benefits. About 11 percent of all the water used in America is for personal domestic use, according to the USGS. According to data from the National Health and Nutrition Examination Surveys, the average American drinks a little more than 4 cups of plain water per day. The average daily amount of total water Americans consume is about 3.18 liters, or 13.4 cups, but 48 percent of that comes from beverages other than plain drinking water and 18 percent from food. Although there's not much difference between racial and ethnic demographics on plain water intake, men drink a bit more water than women, and most Americans drink less water as they age. Young children drink about 1.4 liters of water per day and teens about 2.4. Roughly 30 percent of that intake is from plain water. 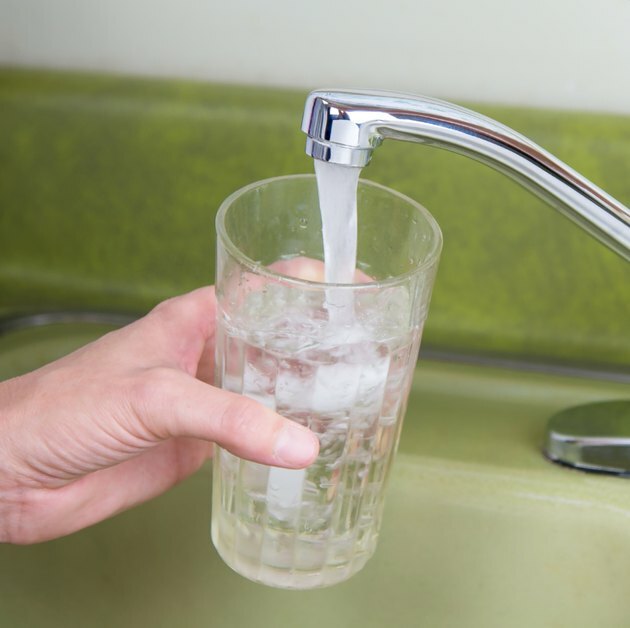 The USGS says that about 11 percent of all the water drawn from water sources in the United States goes toward domestic use. This includes plumbing, laundry, sanitation and lawn watering, but also water used in businesses and restaurants. On average, American residences use a collective 25,600 Mgal each day. Estimates about how much water each person uses in the United States range from 200 to 500 liters per day. Water research and contracting firm Raymot Pty Ltd. compiled average water consumption based on various household functions. For example, brushing your teeth with the water running and washing your hands consume 5 liters each and flushing the toilet about 11 liters. A bath is about 120 liters, and a shower consumes about 20 liters per minute. Washing clothes uses about 150 liters per load. Farming irrigation accounts for about 31 percent of all water use in the United States, with about 128,000 Mgal poured out daily. Almost 75 percent of that is for agriculture in the 17 most arid Western states. Another 2,140 Mgal goes to watering livestock. Industrial water withdrawal for manufacturing uses about 18,200 Mgal per day. The biggest draw on water, 49 percent, goes toward thermoelectric power. According to the Water Footprint Network, the United States has a "water footprint" of 2,483 cubic meters per person each year. That's about 644,051 gallons each. "Water footprint" refers to the total amount of water that is used to produce the goods and services consumed by the inhabitants of the nation. The average footprint is 1,243 cubic meters in the rest of the world. Close to 1 billion people worldwide don't have access to enough clean drinking water, according to Charity: Water, a nonprofit seeking to deliver water to developing nations. Drinking enough water is important for sustaining life, as well as maintaining your metabolism. Considering how much water Americans use, most don't drink enough of it. Public health organizations have a variety of recommendations as to how much water is necessary, but generally speaking, total fluid intake should be around .06 glasses per pound of body weight. According to the U.S. Department of Agriculture, 30 percent of the people who participated in NHANES didn't drink enough water. Research in the "American Journal of Clinical Nutrition" says that after age 3, most children don't get enough water. What Are the Health Benefits of Bottled Water?